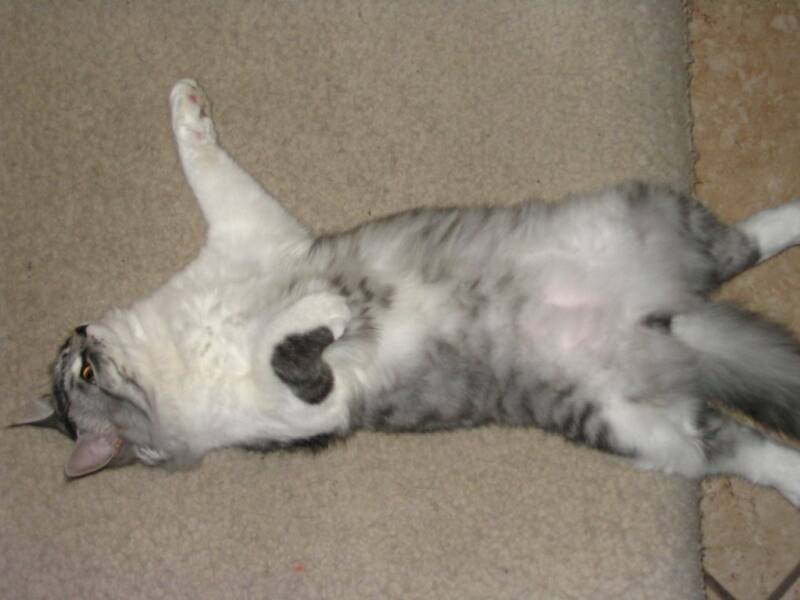 Tigger, totally relaxed in his new home in Tucson, AZ. A large percentage of our business comes from repeat and referral customers, which does our hearts good and tells us that we must be doing something right! 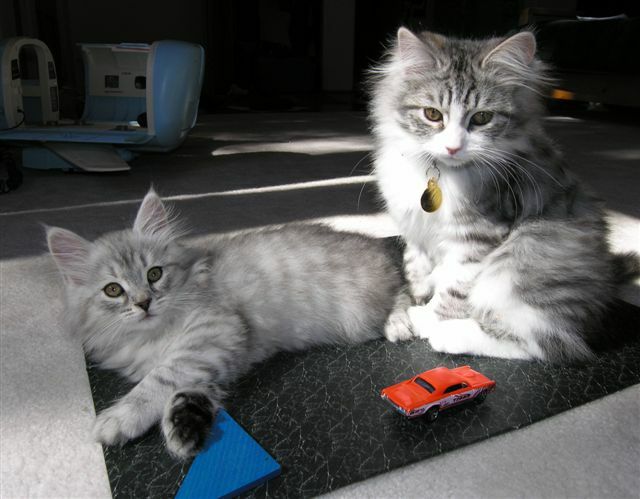 We spend a great amount of time and care in socializing our kittens, so that they'll grow up to be loving and playful. 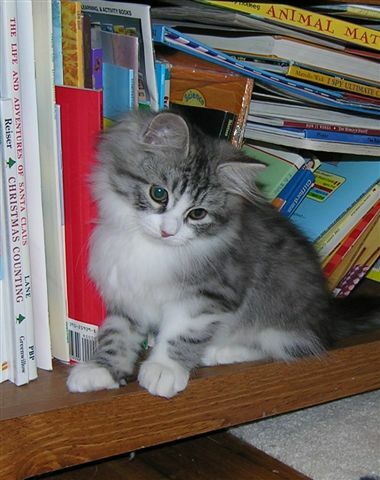 Raising Siberian kittens is a work of love. 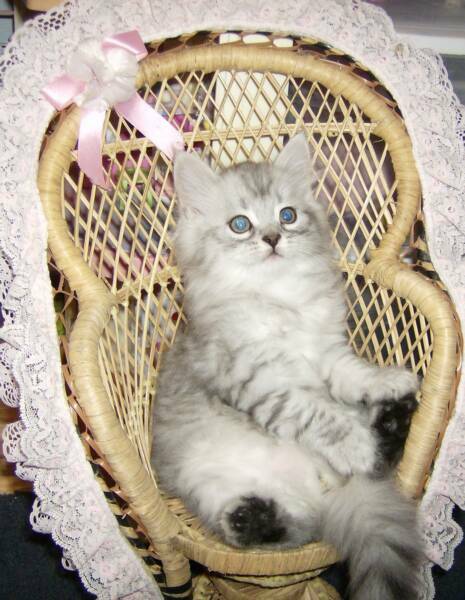 And it's gratifying when we see people who are allergic to most cats find out that they can have a Siberian. It opens up a whole new world to them. 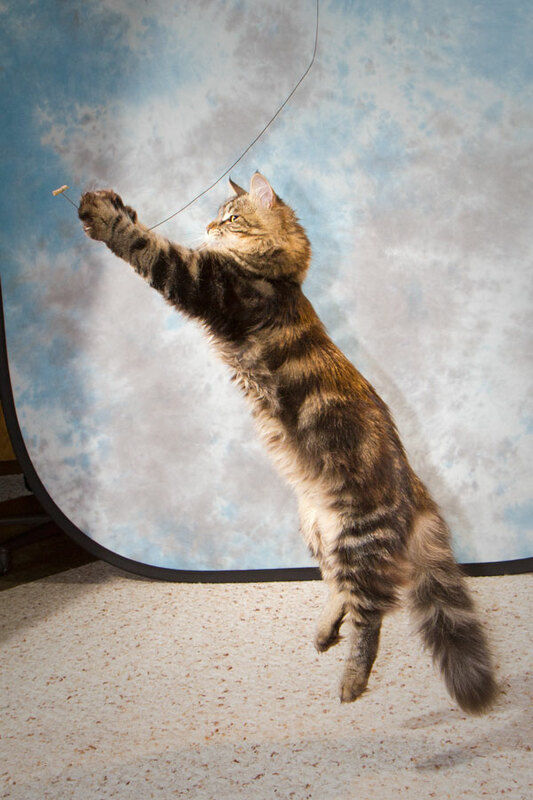 We enjoy staying in contact with the people who buy our kittens - answering questions, offering advice, and receiving pictures and feedback. Here are a few comments and pictures from previous customers. 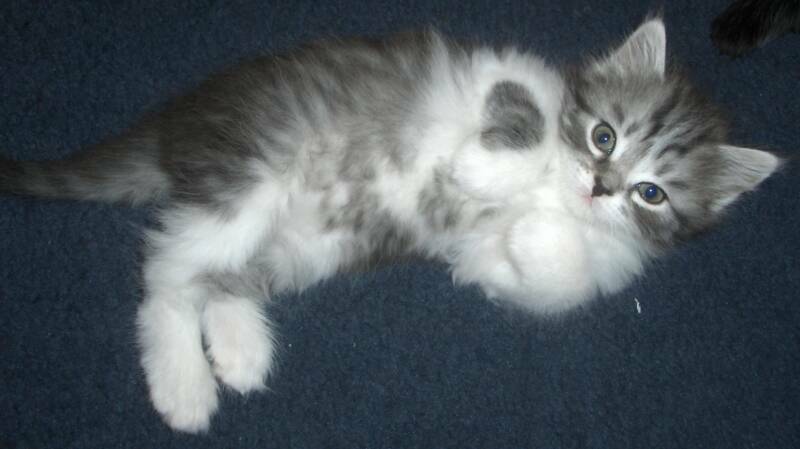 "Romeo (a blue tabby) is getting so big! He loves to snuggle and play. He is the most gentle kitten. We love him very much. We call him the cat/dog. He waits at the door as soon as he hears the car doors. He is one loving cat. I just want to say that your kittens are raised with great love and care and when they go to their new homes, it shows with their attitude. We would never get another cat unless it was thru you. " 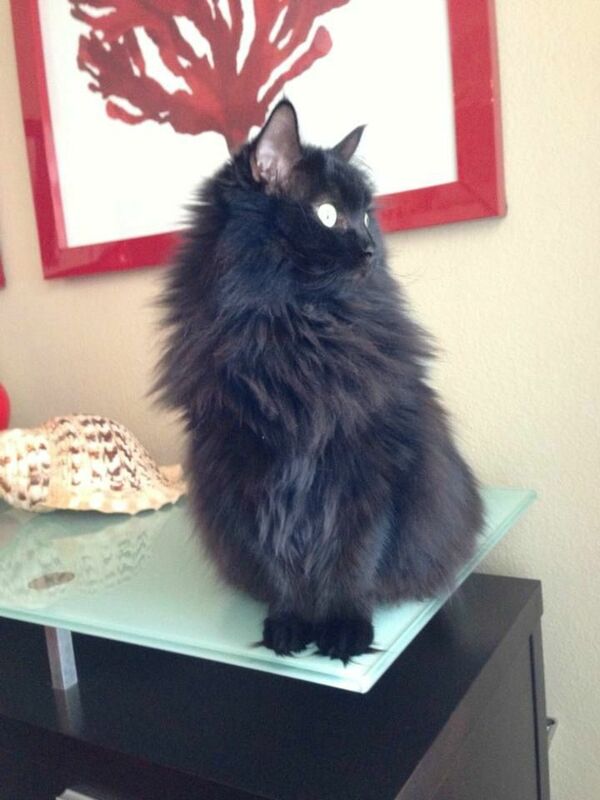 "Luka (solid black) is a wonderful addition to our family! He's different in some ways from Romeo, playing for hours, and even more sweet and cuddly, if that's possible. 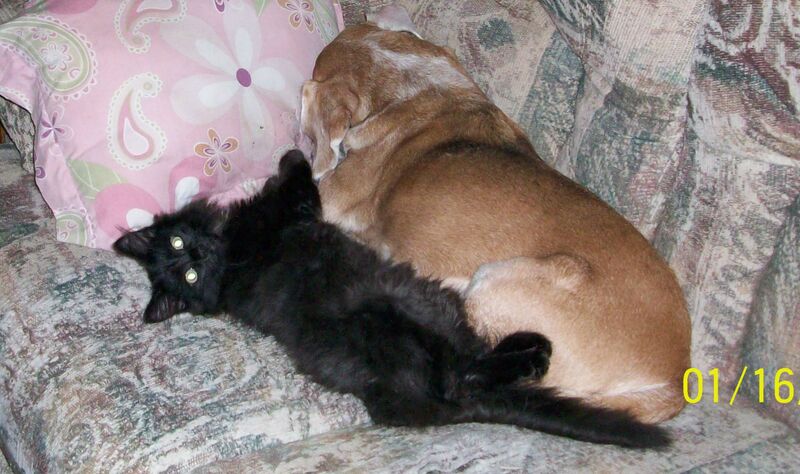 He and Romeo are buddies with each other and with the dogs. 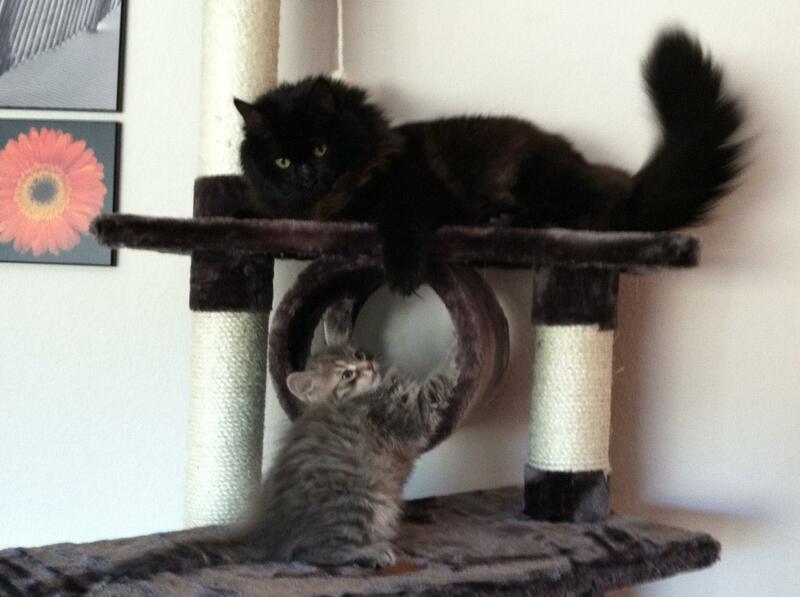 We love Luka just like Romeo and want to say thanks again for raising such wonderful kittens." 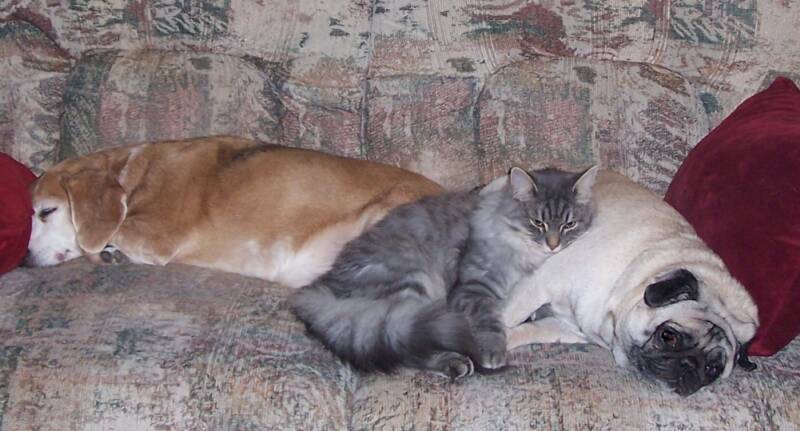 Niko became the cherished pet of a young couple in Colorado Springs. "His pictures don't do him justice - he's magnificent! And he's so friendly and popular with everyone!" 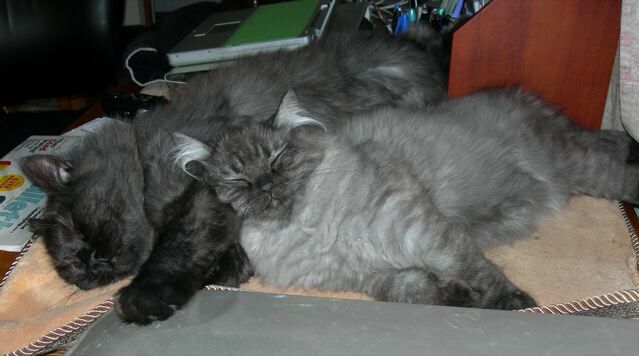 We could see why he's so popular, when the couple returned to buy a 2nd kitten - and brought Niko with them. 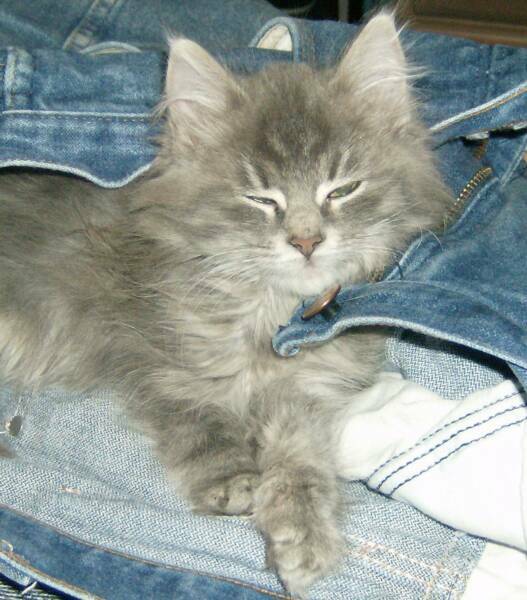 He was then 10 months old and weighed 13 lbs, with a very friendly, confident personality. "He is everything you said he was, and more! 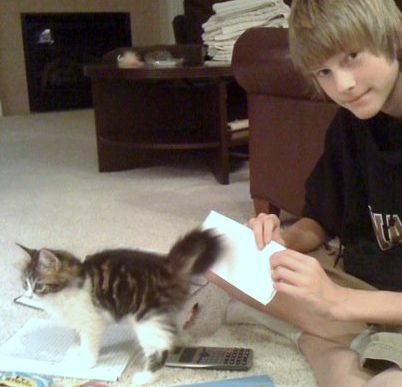 My wife, who never liked cats, is crazy about him." 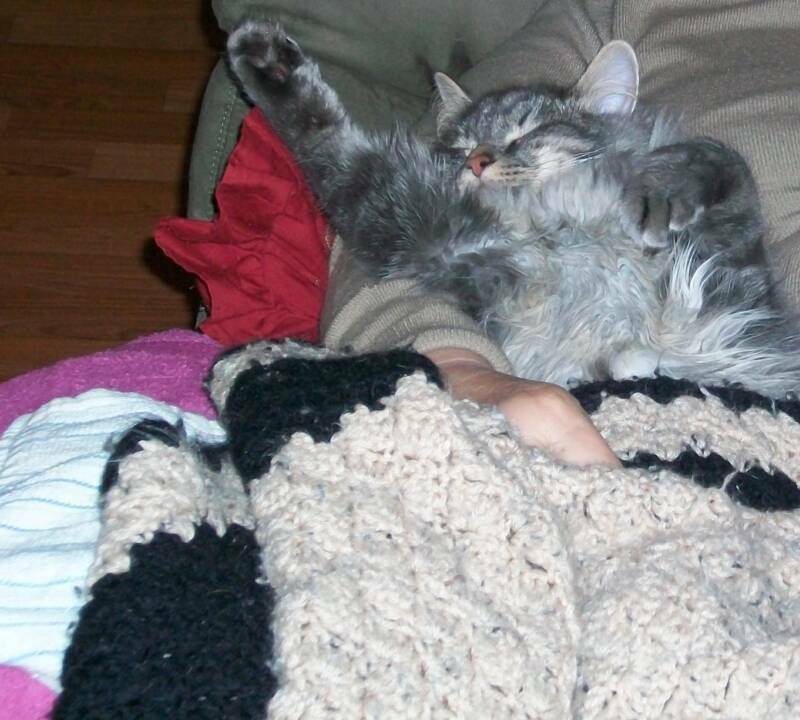 "He is one of the best cats I recall ever owning, or actually, I guess he owns us. We all just love him to death and are very happy with our choice. 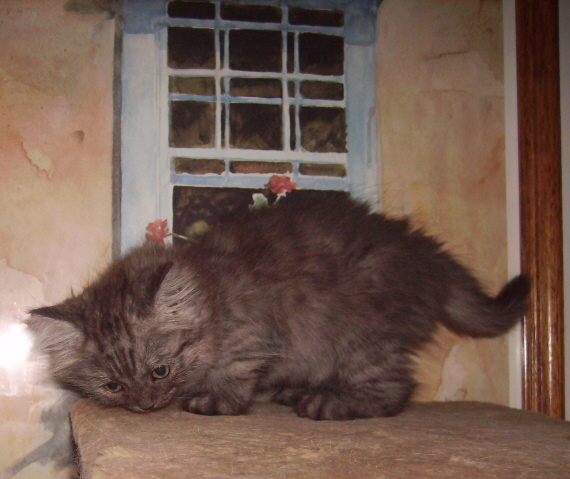 Thank you again for this opportunity to own a great pet,"
Silver tabby with white kitten at 7 weeks. 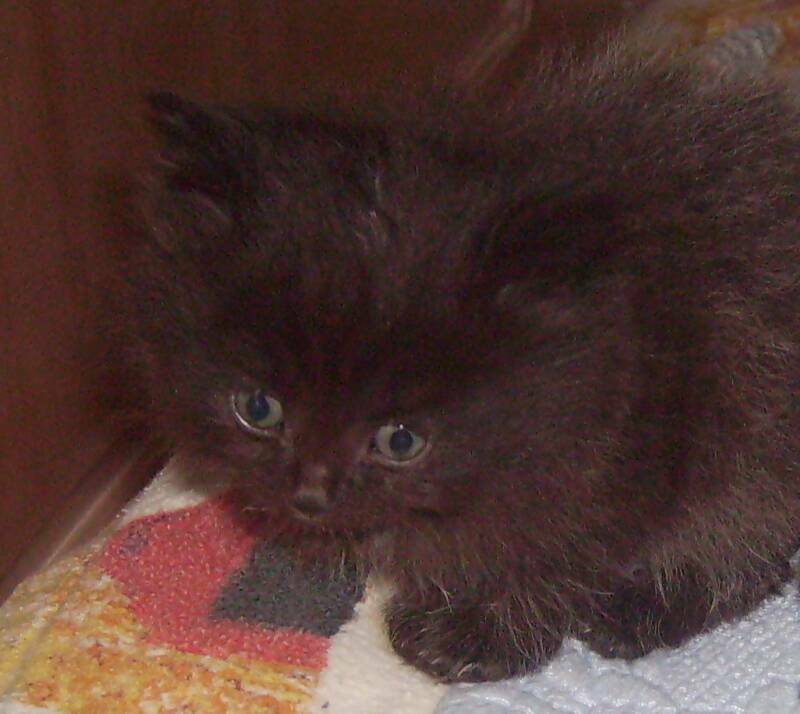 "Bishop (a smoky black) is getting bigger and fluffier, seemingly everyday. His coloring is incredible.... What a gorgeous and distinctive looking cat he is! Jeanne, I cannot tell you how much we adore this cat. He is more perfect than we ever could have imagined. 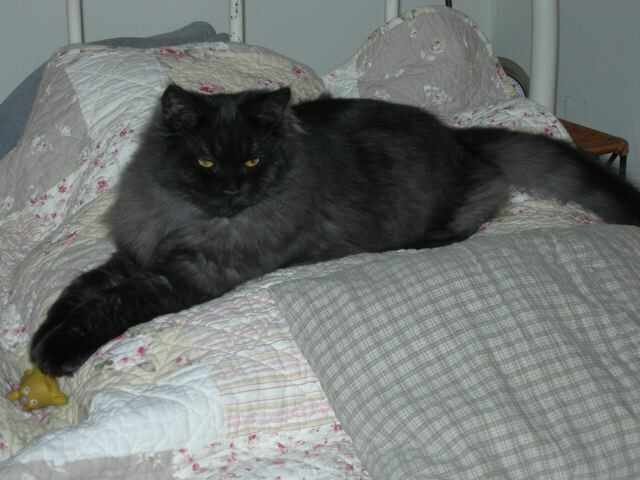 He is always friendly and sociable, loves meeting new people, and will occupy any lap that is available. He greets us at the door whenever we come home. I have never before met a cat that seems so happy as ours. 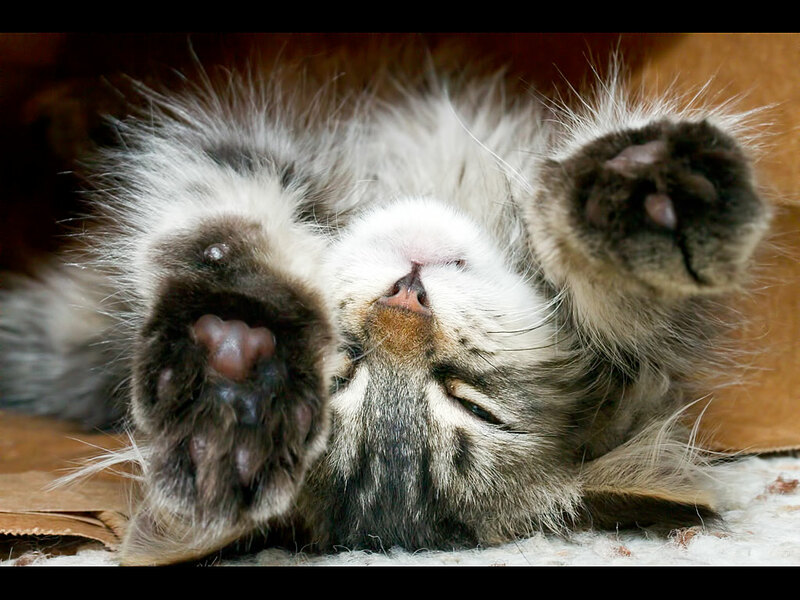 He purrs constantly; all you have to do is look at him and he rumbles like an earthquake. " Doug M in Boulder, CO.
"I can't tell you enough about how much Zhiva and Luka have added to our household. They love each other. From day one, they have such a good time playing and cuddling. Luka is such a cuddlebug. I touch him and he is a purring machine. Zhiva is so gorgeous and such a sweetie. I weighed him today; 9 months old and 15 pounds! Luka is 6 pounds [at 4 months]. Their personalities are very different. Zhiva can jump really high and Luka climbs. Friends are amazed at their friendliness and fearlessness. They love to sit on everyone's laps. Thank you so much for two fabulous sweet cats." 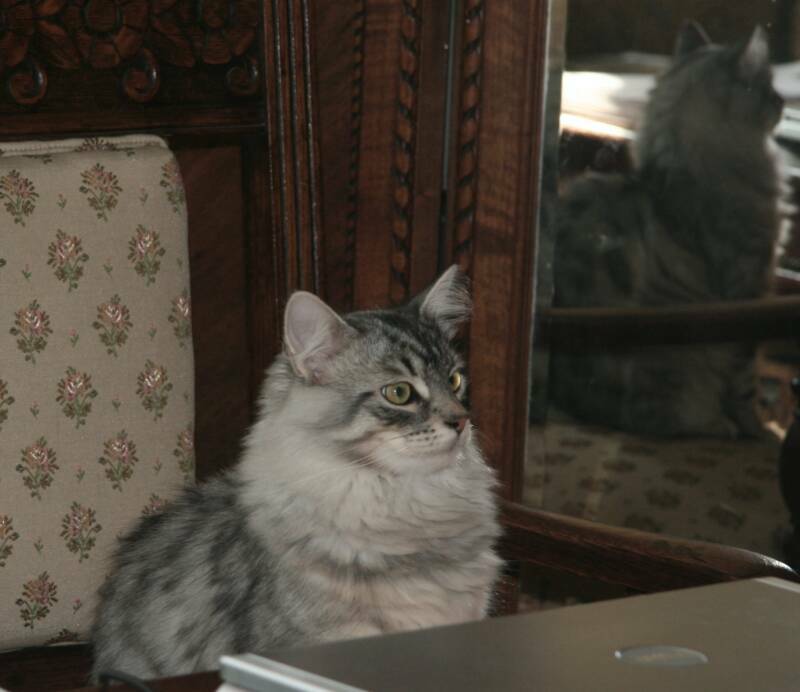 NL in Boulder, CO.
Natasha is a real beauty who epitomizes many features of good Siberian type: rounded ears with linx tipping, full ruff, large paws, lush coat, fuller-brush tail, and a facial expression that hints at both sweetness and her ancestors' wild heritage. 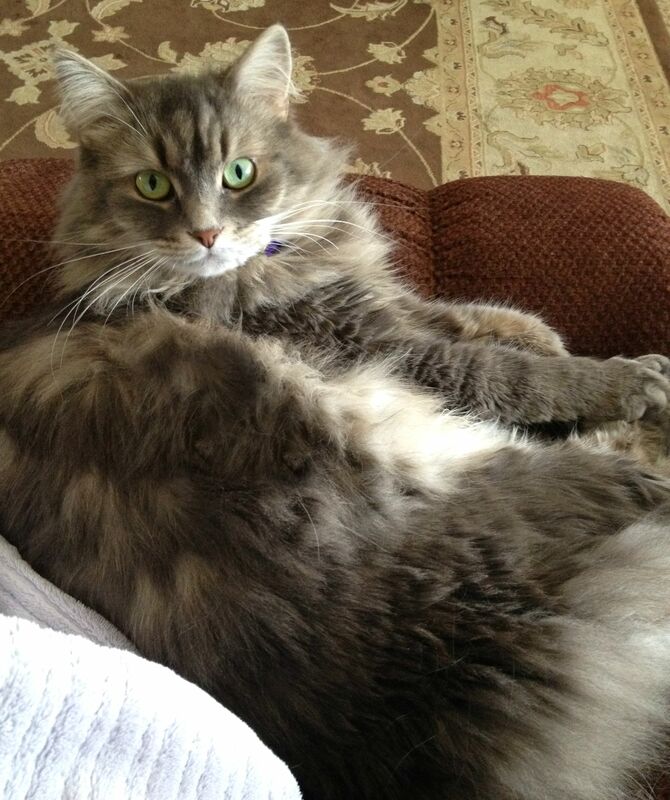 Natasha's new owner writes: "She is actually exquisite!!" 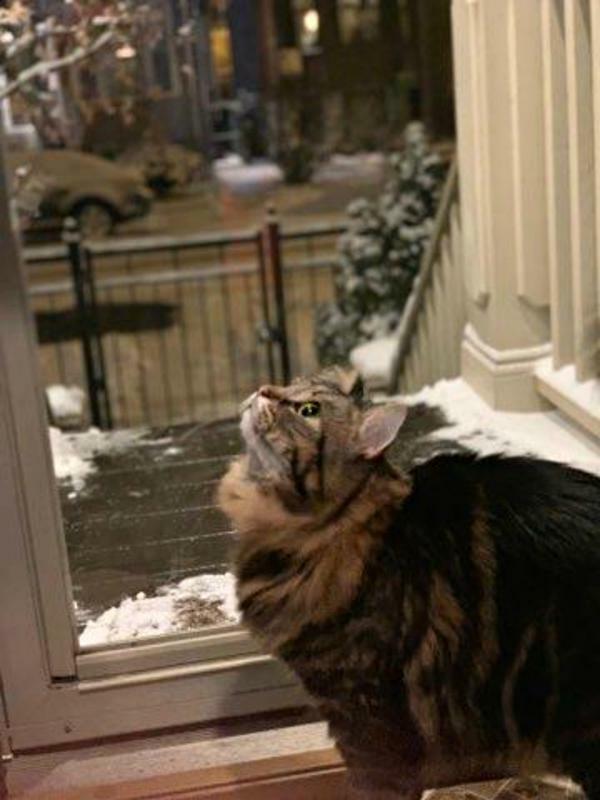 "Just wanted to let you know again, how happy we are with our Siberian girl. 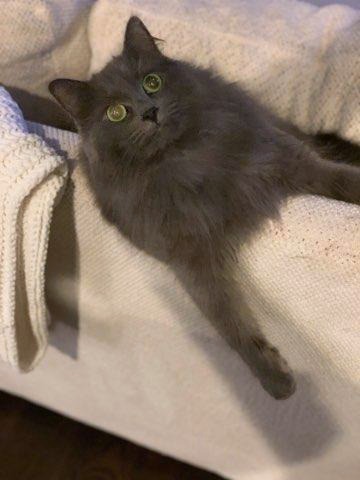 We really wanted a cuddly, friendly, loving girl and that is exactly what we have! She lets my 16mo old, practically lay on top of her! Leena's new stunt is...we have a little toy doll stroller that our 3 girls play with. - Leena jumps into it FREQUENTLY and looks to be pushed!!!! TOO FUNNY AND CUTE! Everyone that stops over here...falls in love with her instantly! Thank you soooo much." 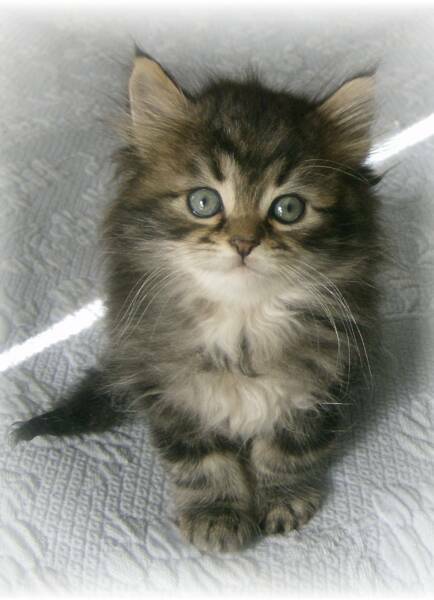 "Nickolai (a silver tabby) is darling, affectionate, & playful. We had some company over, & he wasn't at all apprehensive. He made himself known to everyone, & all were entertained! All I had to do was point to his bed and he went in. A very special boy! He absolutely loves people, and he likes to eat his kibble by having me throw it in the air while he catches it with his mouth! All my friends/relatives say he is more doglike that catlike. He is!" 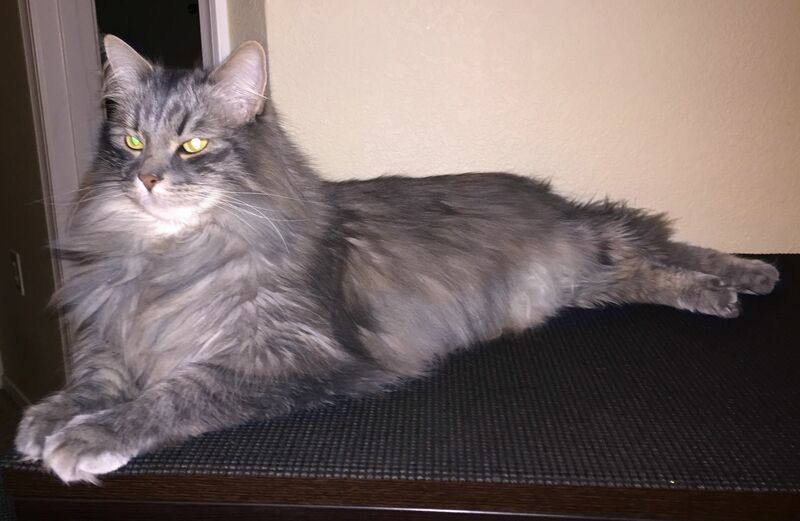 "Graycee will be 1 year old in Sept, & Nicky will be 2 in Dec. She's close to 10 lbs, and he's over 13 lbs. They get along wonderfully and are both extremely intelligent. 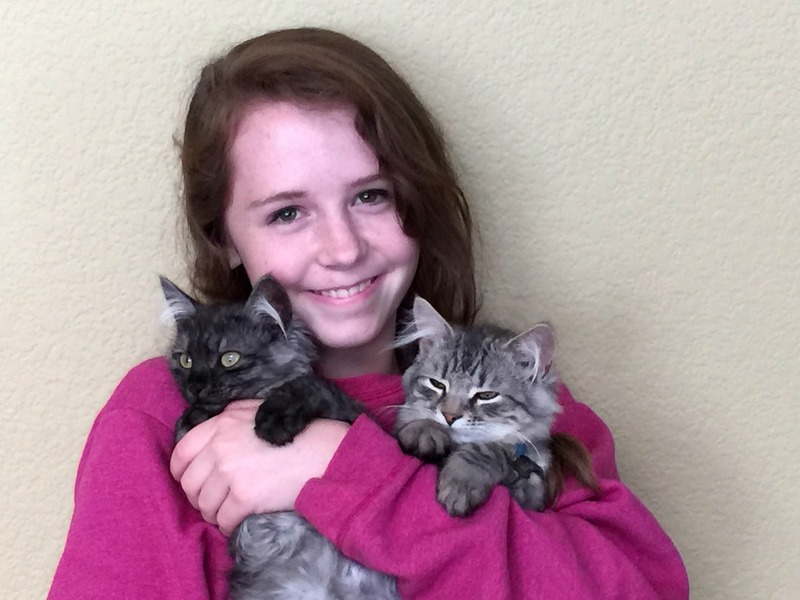 Nicky has always been a genius, & Graycee is an absolute sweetheart and delicious feline." "Zeus... will be one year old this week. 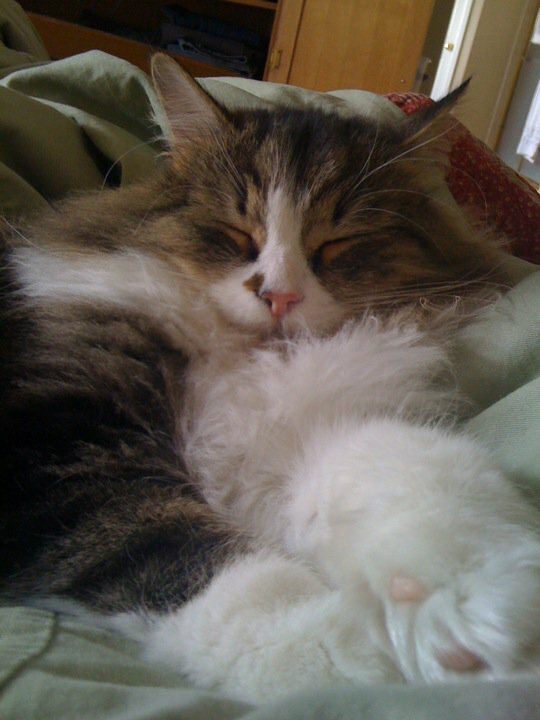 He’s the most amazing cat I’ve ever known and we love him madly. Our whole household adores him. I just feel like he would be happier to have a feline companion. 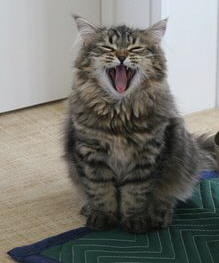 The only cat we would ever get would be one of your Siberians." says of her brown/black tabby boy. Zeus living the good life! ...brought more joy, laughter, and love to our family than we could ever have imagined. They're loving and interactive, and cuter than anything! My husband, who has never liked cats, is over the moon for these two. He plays with them for hours! And we've started napping again - with them on our chests. Even our teenagers are calmed and quieted by their incredibly affectionate natures. We are laughing and loving more as a family. I actually believe that you are changing the world for the better by changing people's lives through your wonderful kittens. 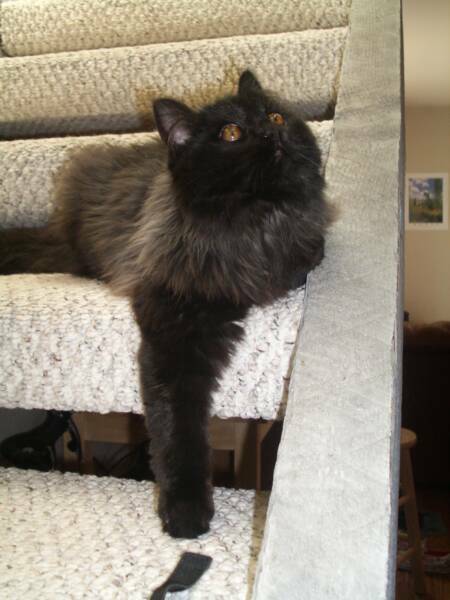 "Hi Jeanne, Kisa is doing great and is such a wonderful addition to our home. She doesn't bother anyone who has allergies, even my sister-in-law who ends up in the hospital from cats. 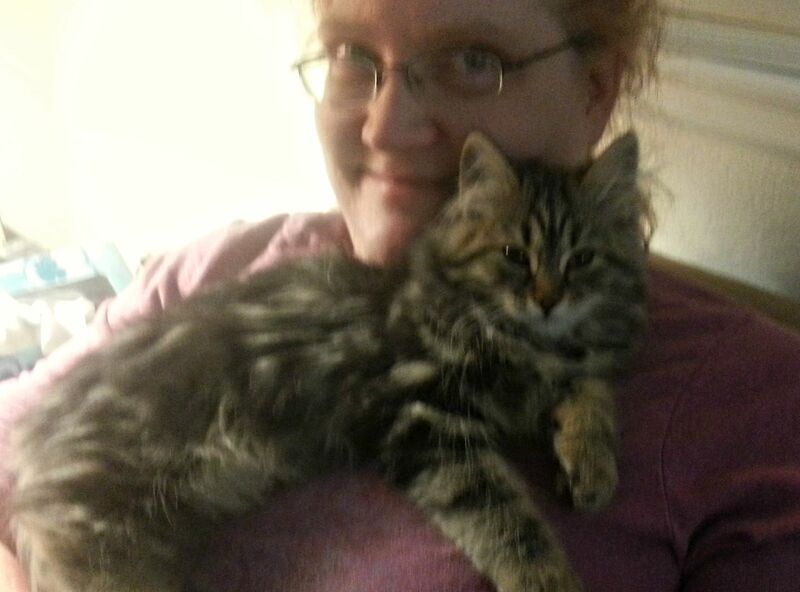 Kisa follows us around like a puppy and loves to hang out with us. She comes when we call her name and even does a few tricks. She rides in a basket on my bike when we go riding and travels better in the car than the dog." surgery. 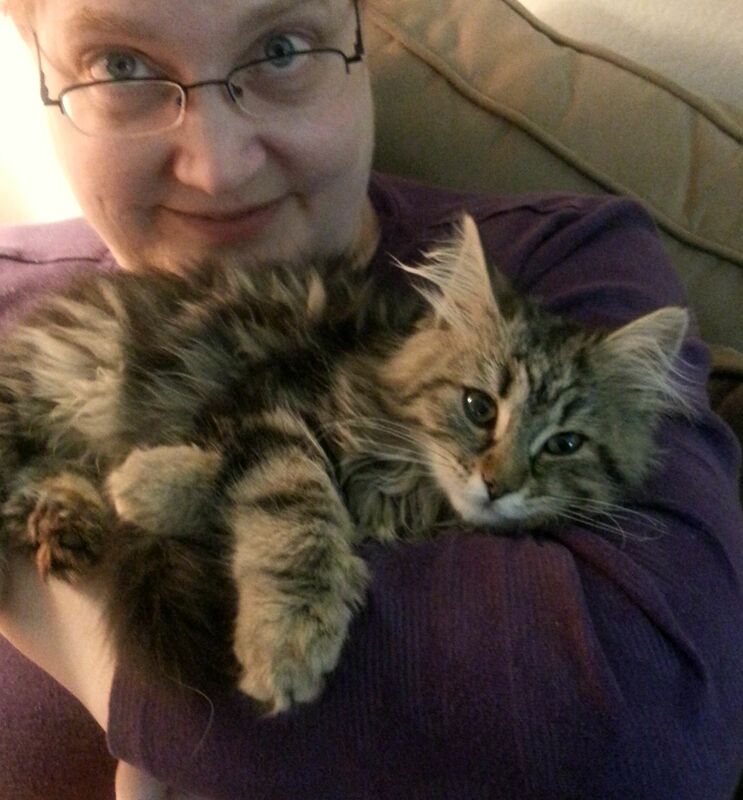 I plan to work with her to become an official therapy cat when I'm recovered. She also makes me laugh as she fetches twist ties rolled into balls. It's hilarious! And you judged her temperament just right in terms of matching her to fit in with Kisa's personality. She and Kisa get along really well together. Thank you again for our two wonderful cats! They have been a blessing to our family." "Stoli is amazing! He's absolutely delightful in every way! He loves to snuggle, play, and eat. He's affectionate and cuddly. We adore him and can hardly imagine what our lives would be like without him. His markings are coming out more, and he's one handsome lad! His coat is soft and shiny. 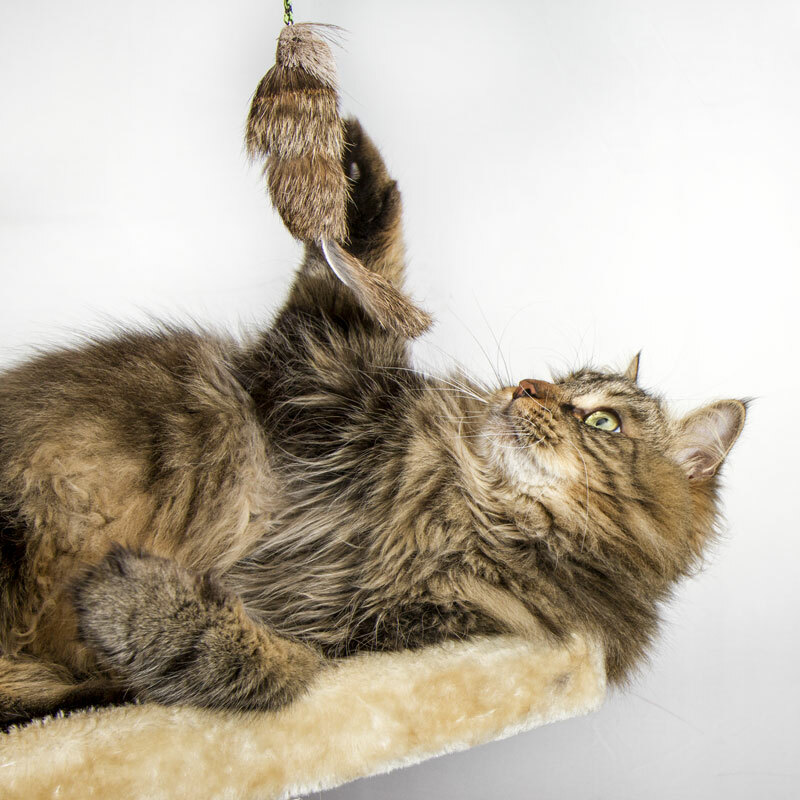 "His favorite way to play is with the Cat Dancer toy that you sent. He does incredible acrobatics while chasing it, as you can see in the picture (at right). I've taken countless videos of him too." 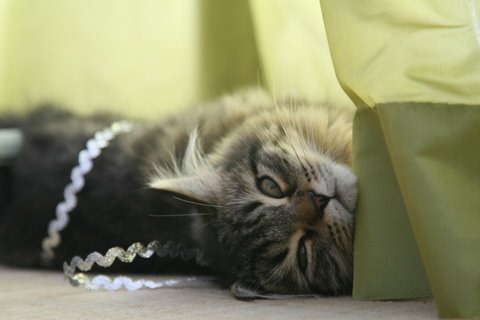 "Our Isabella is the most beautiful and playful cat. She's doing great. She is so gentle, full of energy... a loving girl. We love her so much! And that's why we would like to provide feline companionship for her from your cattery...."
"Alexander is so precious - and he seems so tiny compared to Isabella. But she's so good with him...."
"Alexander is all in 1. He's 4 years old now and thinks he's a kitten. He will fetch toys and is always waiting at the door for me to come home. He loves to snuggle. You can do almost anything to this cat & he loves it. He is in love with us... especially me! 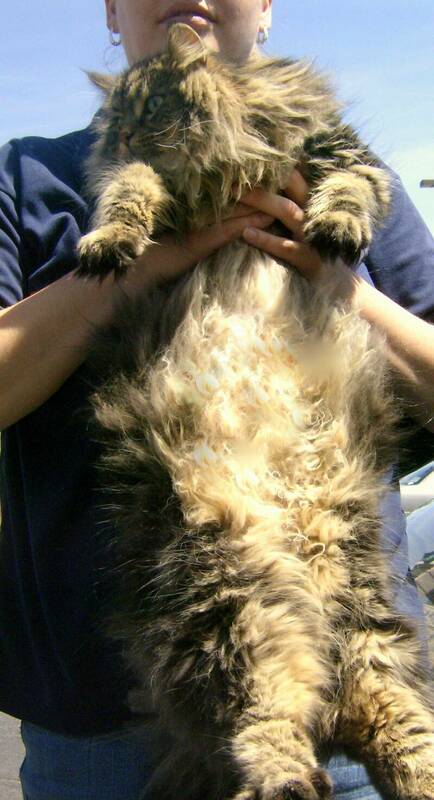 Our vet said he had never seen such a cat, and he wanted to buy him!" "Alexander & Isabella love each other! They are always playing together and grooming each other. 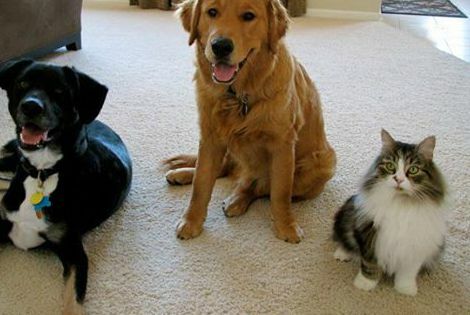 We are so grateful to you for bringing them into our lives. We appreciate all you've done for us!" 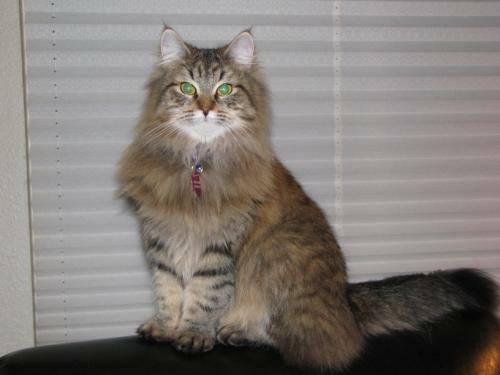 "We have had an adult Siberian cat for years, and we were looking for a Siberian kitten to keep her company. We approached all of the Colorado breeders, asking some basic questions. 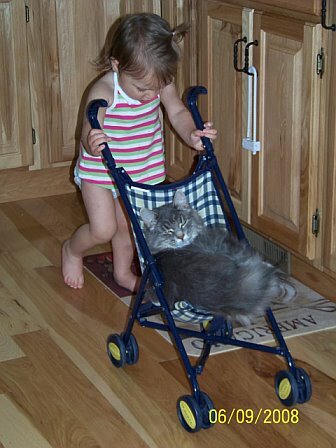 Only Jeanne of 7 Cedars took the time to help us think this through and find the best solution for our cat. 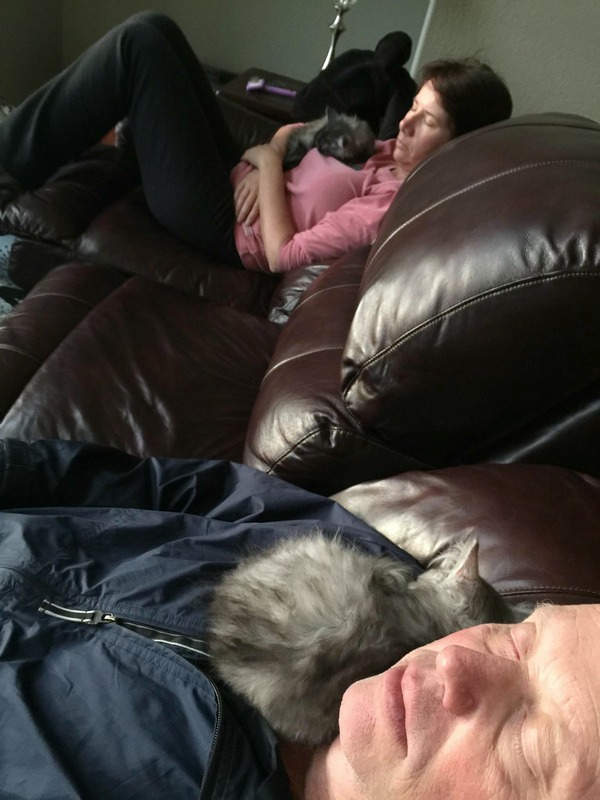 And Jeanne has contued to support us with coaching while our cats adapt to each other. "Clearly, she raises her kitties with care, putting their welfare first. Our kitten purrs all the time, reflecting that he has known only love. ...our family than Anthony. He even gets along great with the dogs. Thank you for an awesome cat!" "Lamar and Crystal are doing very well, and we are loving every moment of their companionship. It's hard to imagine what our lives were like before they arrived!"